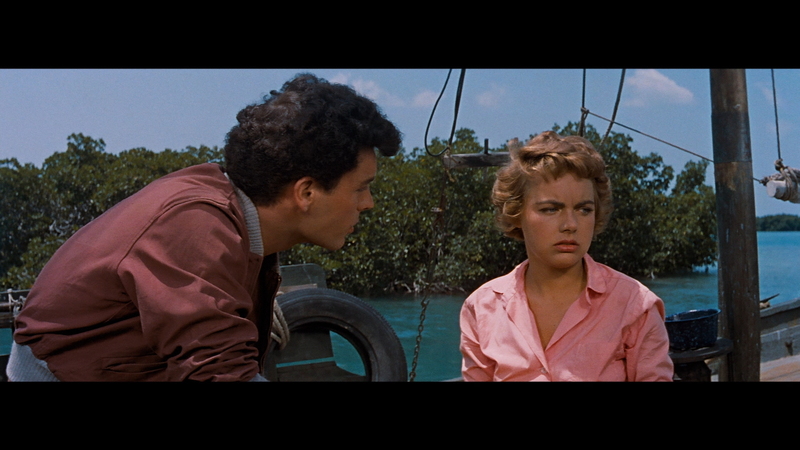 Description: One of the earliest CinemaScope™ pictures, Beneath the 12-Mile Reef (1953) takes us deep into the crystal-clear, perilous waters off the Florida coast, where two rival sponge-diving families produce a boy (Robert Wagner) and a girl (Terry Moore) who of course fall for each other, hard. 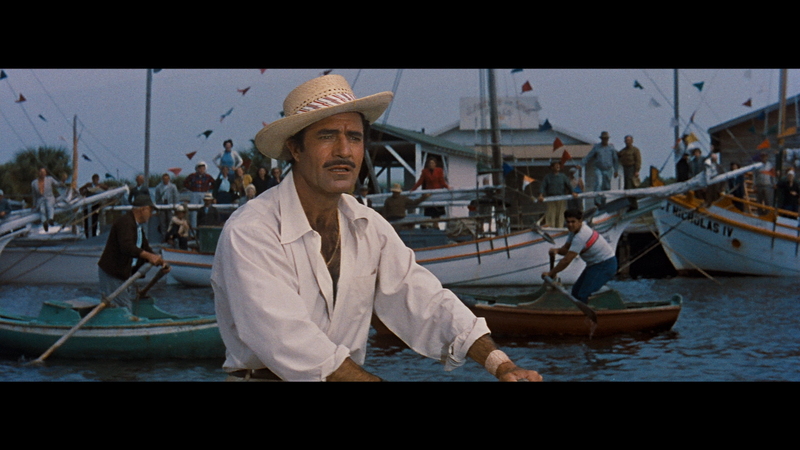 Stunning widescreen underwater cinematography by Oscar� nominee Edward Cronjager and a staggeringly atmospheric score from the one and only Bernard Herrmann are added attractions. 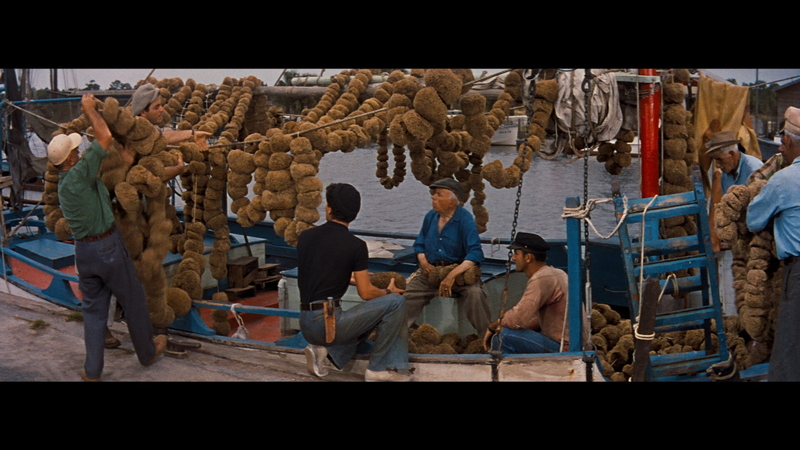 A perfect choice for the CinemaScope format, Beneath the 12-Mile Reef is about a Greek family who make their living diving for sponges off the coast of Florida. Their livelihood is a dangerous one, though, due to the unpredictable weather and the dangers of the 12-mile reef. 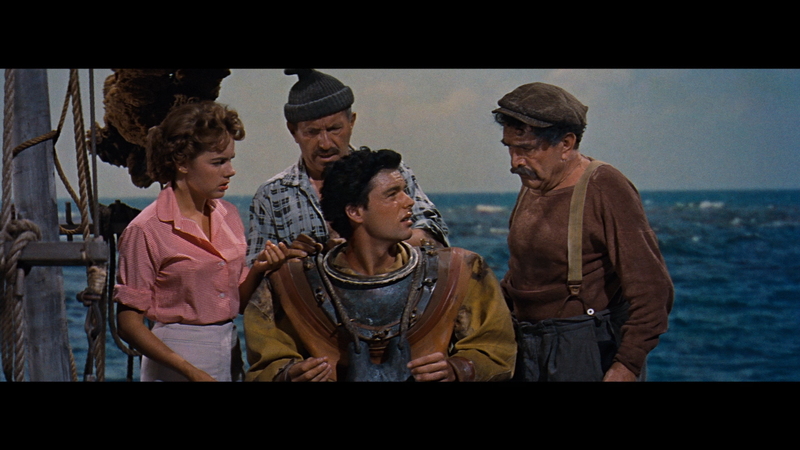 Another problem the family faces is ethnic discrimination from the local Florida sponge divers who resent any "outside" competition in their profession. 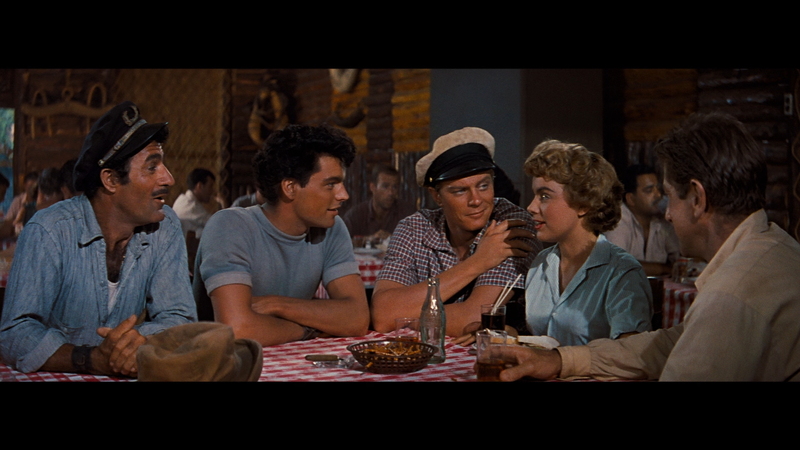 Tensions between the two clans increase when young Tony Petrakis (Robert Wagner) falls in love with Gwyneth Rhys (Terry Moore), the daughter of his father's main rival. 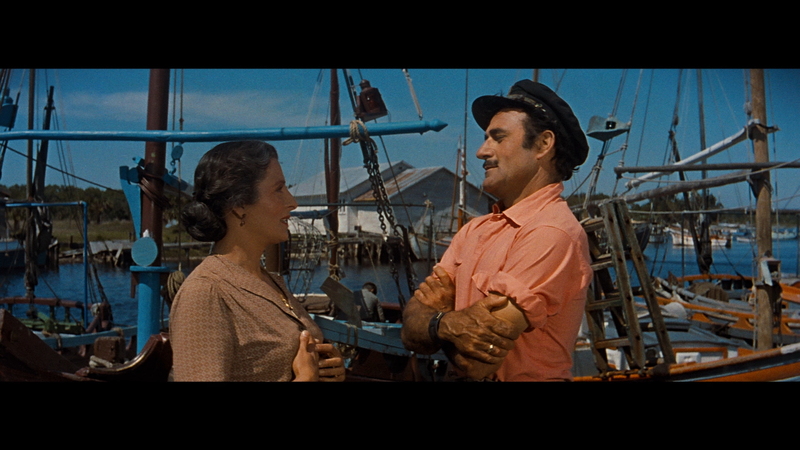 While the Romeo and Juliet-inspired romance provides the emotional fireworks in Beneath the 12-Mile Reef, it is the natural outdoor settings and stunning underwater photography that make this particularly memorable in CinemaScope. 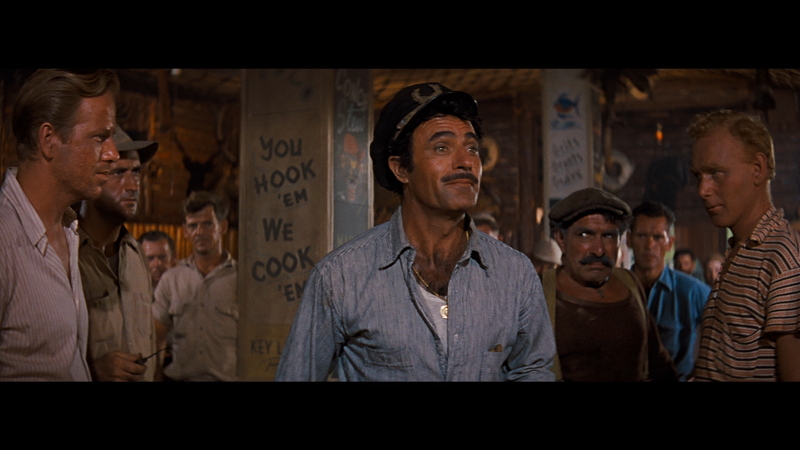 Wagner and Moore replay Romeo and Juliet in Tarpon Springs, Florida, with rival sponge fishermen standing in for the Montagues and Capulets. 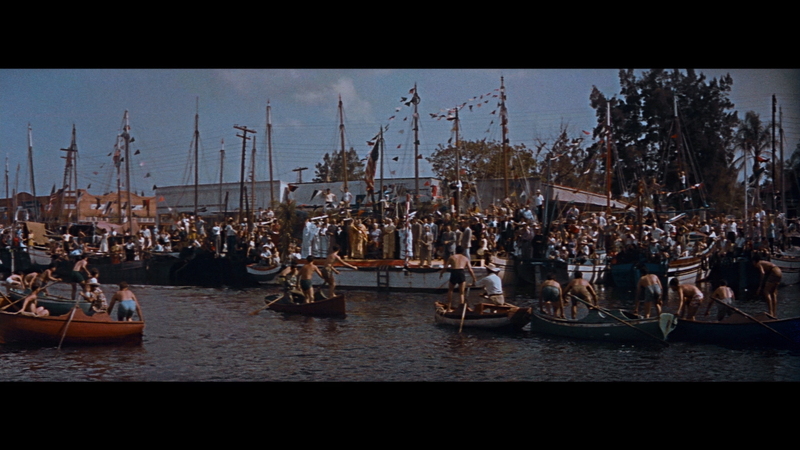 One of the earliest CinemaScope pictures, it looks better than it ought to, and Bernard Herrmann provides an eerie score. 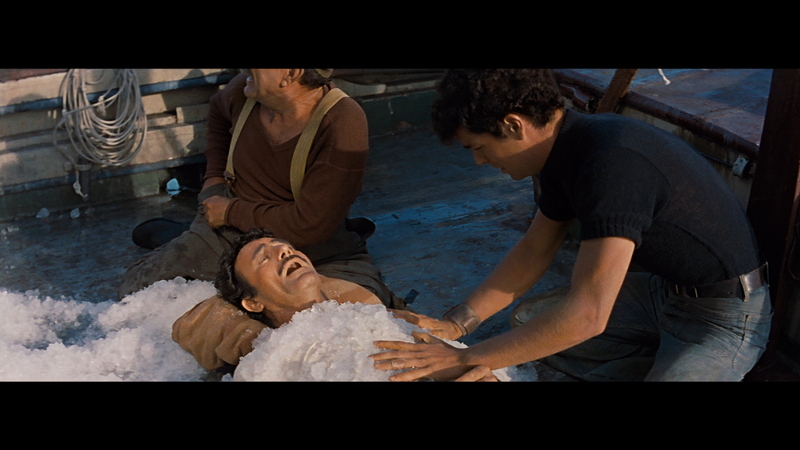 But it's best remembered for the incredibly young Robert Wagner scrapping with an octopus (you won't get that in staged Shakespeare). 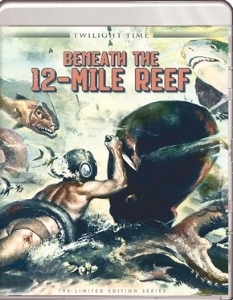 Beneath the 12-Mile Reef comes to Twilight Time Blu-ray in a dual-layered, 1080P transfer with their usual high bitrate. The image has a blue-leaning but looks quite good. 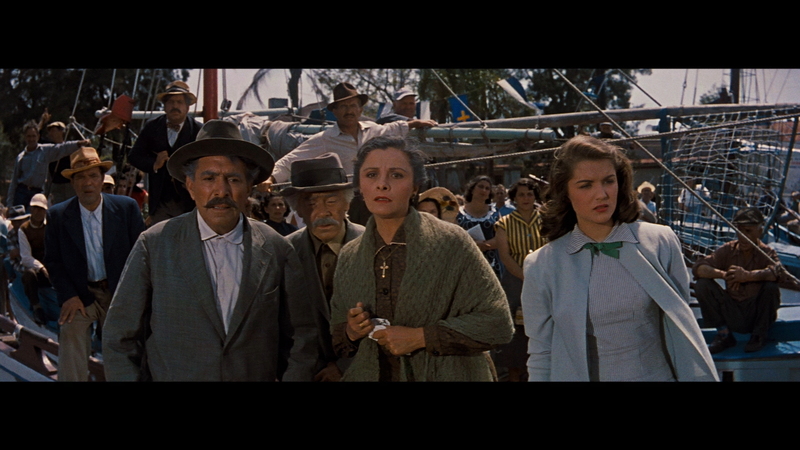 The super-widescreen is impressive in-motion and Technicolor is vibrant, rich and deep. 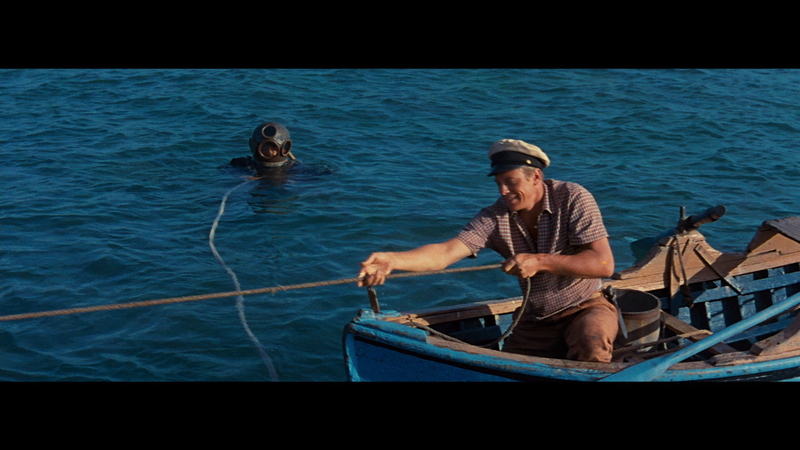 They used an Aquaflex as the underwater camera that looked fairly good considering the age of the film. Aside from the teal infiltration this image looks very appealing. There is plenty of depth, detail and strong contrast. 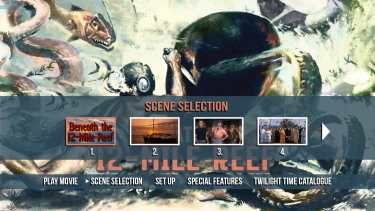 Twilight Time give the option of a DTS-HD Master (24-bit) 5.1 surround bump, as the film had a 4-Track Stereo originally, and a DTS-HD Master 2.0 stereo choice. 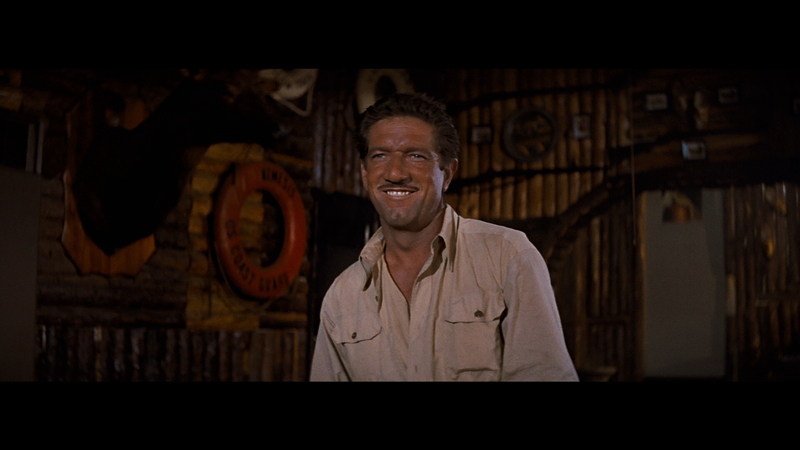 The 4.0 channel was my choice and it sounds adventurous, clean and the intense score by the great Bernard Herrmann (Cape Fear, The Magnificent Ambersons, Taxi Driver, The Wrong Man, Dressed to Kill, etc. etc.) is represented beautifully in lossless. Twilight Time offer their usual isolated score - which is a nice bonus for the composer's fans. 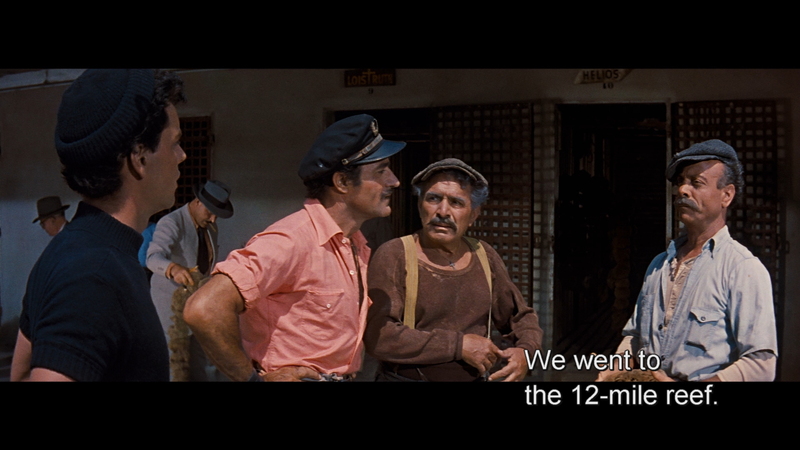 There are optional English (SDH) subtitles - see sample below. The Blu-ray disc is region FREE. 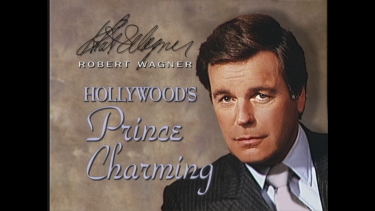 Included is the old 3/4 hour Robert Wagner - Hollywood's Prince Charming biography of the actor. 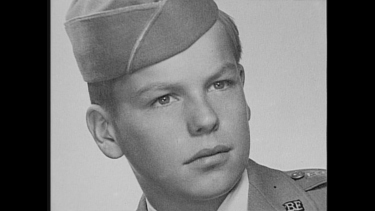 It has some value with plenty of clips of his films and other celebrities praising him. There is the aforementioned isolated music track, some liner notes by Julie Kirgo and it is, again, limited to 3,000 copies! 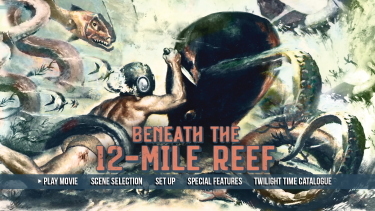 Beneath the 12-Mile Reef is an old fashioned 50's adventure - some faux-drama but a sweet family-oriented premise of working immigrants plying their trade. Yes, it's pretty wholesome and has plenty of nostalgia value. Great scenery. 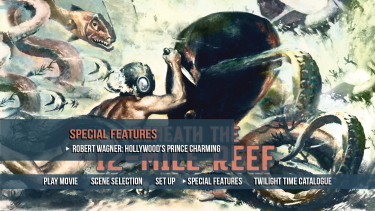 The Twilight Time Blu-ray provides a 1080P transfer for the film and a featurette on the lead actor. I enjoyed it but it isn't something I'll be watching anytime soon - I love the title which conjures up many imaginative scenarios but it doesn't really fulfill those expectations - neither does the cover (that I LOVE!). I'm sure that some will appreciate more than I.